BASIC, PLUS+ and PREMIUM☆ - what's the difference? There are 3 different types of accounts you can have here with us on Studyclix: BASIC, PLUS+ and PREMIUM☆. We often get asked, "what's the difference?" or "why should I upgrade?". To understand more about the differences between the accounts and learn about the benefits of upgrading, just keep reading! Anyone can sign up to Studyclix with a free BASIC account. With BASIC, you can access our notes and videos and post on the discussion board. BASIC account users also have limited access to exam questions and marking schemes. For each subject topic, basic users can view 3 questions (2 state and 1 mock) and 3 marking schemes. In addition to all the features offered with a BASIC account, Studyclix PLUS+ gives you full access to all past state exam questions and marking schemes in all your subjects. The advantage of having a PLUS+ account is access to all state exam questions. When you’re finished studying a topic (e.g. the digestive system) and you want to test yourself, having access to Studyclix PLUS+ can show you every single question that has ever come up on a topic on a state exam. A year’s subscription to a PLUS+ account is €35. The same price you might pay for one grind (or less)! 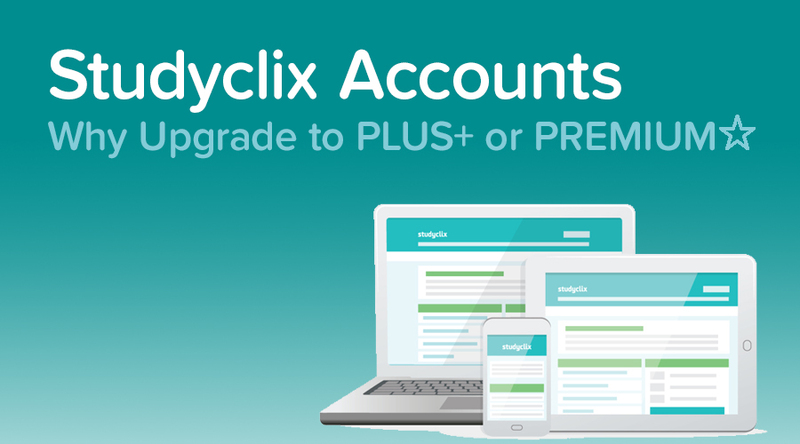 A PREMIUM☆ account gives you full access to Studyclix. In addition to all the state exam questions, we also offer mock questions on all subject topics for only €55 for 12 months. The main feature of a PREMIUM☆ account is access to all mock exam questions by topic in addition to state exams questions. Access to mock papers means access to double the amount of questions those on PLUS+ accounts have. By practicing twice the amount of exam style questions, you’re more prepared for an exam and increase your chance of achieving a high mark. Another major advantage is having unlimited access to our Quizzes feature. Studyclix Quizzes allow you test yourself in an fun and engaging way. Unlike other subject quizzes online, Studyclix Quizzes only have content from the Junior and Leaving Cert exams, meaning everything you learn is relevant. All Studyclix users benefit from our Quizzes features however only PREMIUM☆ users can access all the questions available. Try Quizzes here. Studyclix PREMIUM☆ users also benefit from having our best notes and subject guides sent directly to them.